Of course, everyone has seen a shadow of themselves before. Regardless of whether that shadow is in a painting or it seems to follow you around town, you have seen the way shadows can distort images and make them appear different than what they really are. Years ago, many people would have their picture done where it looked nothing more than a shadow of their face. The distinguishing features were there, but you had a hard time knowing exactly who was in the picture if you didn’t know it beforehand. 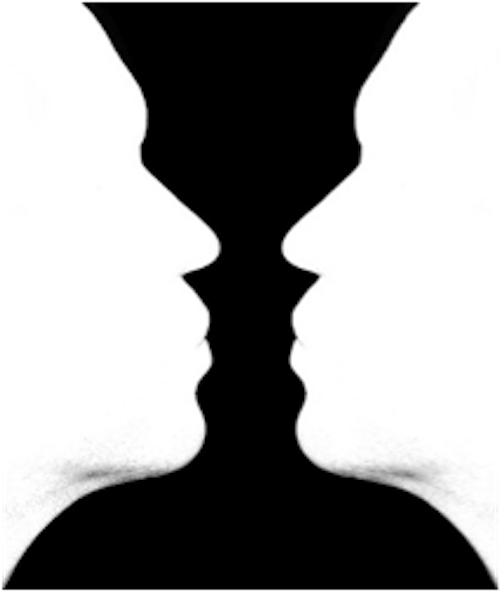 In this vase face optical illusion, it uses a play on two faces to form the object in the middle. When you first looked at the vase face optical illusion, did you notice the faces or the vase first? For some, the vase is what catches their eye immediately. Others don’t even notice the vase until they have it pointed out to them. Everyone is so different in what they are going to see first in this illusion. What was it for you? Upon first glance, I noticed the vase with what looked like a shadow in the background. However, when I sat there and looked at it more, I found that the shadow was actually indicative of the chin of the two faces. Who would have thought something so simple could be so intricate and detailed. This is one of those illusions that it might take a couple times of looking at it to determine what the picture really has in store for you. Make sure and check out the vase face optical illusion to see how much fun you can have with your friends and family. See if they can uncover all of the mystery and shapes behind this fun illusion for the entire family. If you cross your eyes a little it looks like the faces are kissing.